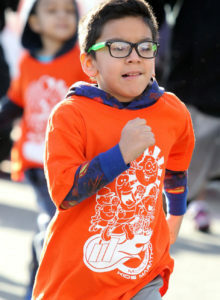 McALLEN — Among the hundreds of kids preparing to run the last mile of their marathon commitment at the McAllen Convention Center, 10-year-old twin sisters Yamaiah and Naileah Hessel were trying to recuperate from the 5K they ran that morning in preparation for the 2019 Let’s Move McAllen Kids Marathon. Naileah has a passion for running and said that having her sister by her side makes it special. She said that today they listened to Cardi B and Beyonce. Yamaiah and Naileah were the first to finish the Final Mile of the fifth annual Kids Marathon hosted by the McAllen Independent School District on Saturday morning. Their mom, Isabel Hessel, said that she has always taught her daughters about the importance of being active and eating healthy. Both Yamaiah and Naileah aspire to play professional tennis when they grow up and said that they are inspired by American Olympic tennis medalist Serena Williams. Isabel said her daughters have the dedication and discipline to follow their ambitions, and is glad that it involves fitness. Runners took on the challenge of completing the marathon when they crossed the starting line of the Veterans Memorial Stadium track in September of last year, beginning the first mile of the 26.2 they promised to run. The kids had three months to document their miles, saving the last one for Jan. 19 to finish the way they started — as a community. McAllen was the first city nationwide to receive the “All-Star Community” recognition in 2016 under former first lady Michelle Obama’s Let’s Move initiative. 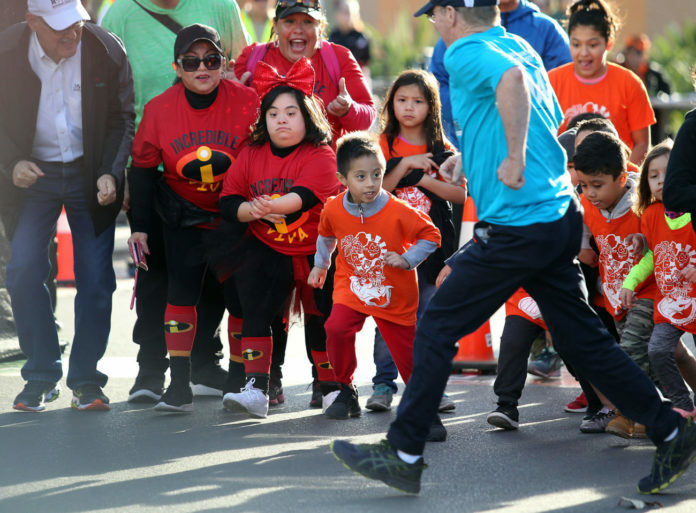 McAllen ISD’s health and physical education coordinator, Mario Reyna, said that after the award, the district was motivated to continue encouraging local students to make healthy choices and decided to start hosting the marathon. 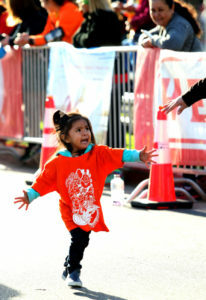 Reyna also said that he hopes that the Kids Marathon motivated adults to pursue healthier living. After kids — and the parents who ran with them — caught their breath, families were invited inside the McAllen Convention Center for a Health Expo. Children with chunky medals hanging longer than their shirts continued to play on the empty street, showing no weariness from the mile they just completed. Vianca Lara, 13, runs for the cross country team at her school and used the skills she learned from her coach in this marathon. She also proved much to herself. Madalin Acantar is 8-years-old and plays basketball with a McAllen Boys and Girls Club league. She said that her basketball practices helped her throughout the marathon and that though it was still arduous, she persevered. Support for the marathon has grown over the years. Local partners include the city of McAllen, University of Texas Rio Grande Valley, Telemundo and The Monitor.